London – Wednesday, 21st January 2015 - On Friday 30th January 2015, Bradford’s Tasif Khan makes his most welcome return to the fray, following a two year sabbatical from the sport, when he faces Hungarian Richard Voros on the Shyam Batra promoted Legends & Prospects event at York Hall in London. First time around Tasif, who turned professional in 2005, proved not only to be an exciting prospect but also highly popular with the fans, so much so that after just his sixth fight young Khan became a regular on events, at the Reebok Stadium in Bradford and at the M. E.N. Arena in Manchester, promoted by Ricky Hatton, including the Amir Khan versus Paul McCloskey WBA World Championship bout in April 2011. For his return bout Tasif is set to face the Hungarian #4 ranked Richard Voros, a tough globe trotting fighter, who is more than comfortable competing in his opponents own backyards, including those in the UK, such as current IBF Inter-Continental Super Flyweight Champion Khalid Yafai, who he fought back in 2012. 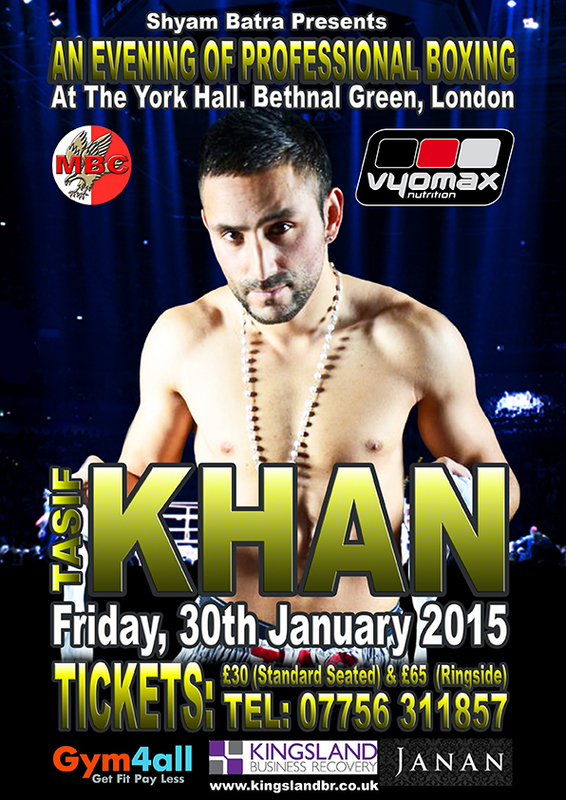 Speaking from his Bradford home Tasif spoke briefly about his impending return to the ring on the 30th January. “I’m really looking forward to the fight, I’ve been itching to be back in, it’s been way too long I’ve been out of the ring. Mentally I feel good, physically I feel good and I’m more motivated and more hungry than ever. I don’t know too much about Richard Voros, other than he’s an experienced fighter, I know he’s had quite a few fights and has fought all over in a number of countries. I don’t doubt he’s going to bring his A-Game, so am I and I’m hoping to put on a really good display for my comeback fight. This fight means so much to me, almost as much as when I fought at the M.E.N. on the undercard of Amir Khan-Paul McCloskey. That was a great experience, I’ll never forget that night as long as I live, it was a great experience and great people. I get on really well with Amir Khan and his family, they are great people, they really made it a great experience for me, all of it even during the build up to the fight. I put in a really good performance on the night, it went really well and was a great experience and puts me in a good position for fights in the future, hopefully get to fight on more big events like that in the future. At the time I didn’t really take it all in because of the moment of the fight and everything like that. This should be a really good night and will be the first time I have fought at York Hall, really looking forward to that, as well as watching George Hillyard when he fights for the WBU International title. I would like to say thank you to all my fans for traveling down to London, I know it’s a fair trek so really appreciate everyone for their support, whether they make it or not. My family and friends have been great, by my side from day one, even with the absence I’ve had I’ve still had great support from everyone and want to say that I am dedicating this fight to my fans because they have been great and stood by me. Also a big thank you to my sponsors Kingsland Business Recovery and Vyomax Nutrition, they have been great from day one, even through my absence and the injuries that have kept me out of the ring. Tasif Khan versus Richard Voros will feature on the Shyam Batra promoted ‘LEGENDS & PROSPECTS event, headlined by George Hillyard versus Michal Vosyka WBU International Middleweight title clash, that takes place at York Hall in Bethnal Green, London, on Friday, 30th January 2015.